The Industry Speaks about Cloud, Part IV: Business leaders demand business transformation support - can providers gear-up to help? Business leaders want to accelerate to Cloud and half of them expect to rely heavily on third party expertise to help them with governance, change management and business process transformation. With both Business and IT decision-makers expecting to allocate 30% of their IT budgets to the Cloud over the next five years, Cloud is going to demand new IT and business operating models and radically different sourcing mind-sets from CIOs and business function leaders. What's more, it's creating a major headache for many of today's service providers, which are enjoying comfortable growth with their ERP and software maintenance and development work. Which service providers truly have the appetite to invest in the consultative expertise and the software development skills to be truly Cloud-capable for their clients, versus those which simply want to shut their eyes to all this and plug away with the same-old IT support work? Ultimately, Cloud will drive disruptive change in the way services are both received and delivered, the pivotal challenge being whether those who resist this radical shift can ultimately survive. The bottom line: Cloud Business Services are going to create a revolution in how organizations provision IT and business services. Business leaders are looking to transform many core businesses processes around Cloud, and show serious intent to make it happen—40% revealed to us how they want support transforming IT and business relationships, and want change management support to make the transformed organization effective. 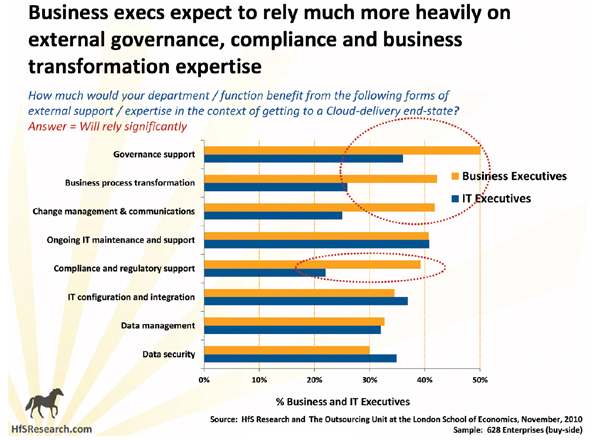 But the eye-opening finding is how critical business leaders view governance capability in achieving a Cloud operating end-state—over 50% of business respondents see governance as critical compared with only 36% of their IT counterparts . 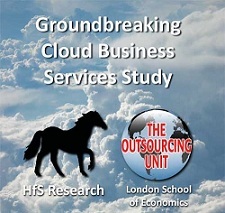 At HfS, we believe we are seeing a new mind-set emerge as firms start to rethink their IT operating models around “digital” governance structures to support the move to Cloud Business Services. Why? Because they expect to source Cloud into the delivery mix and will want their internal IT teams to turn themselves into Service Integrators. Cloud Business Services are not hype: they are going to revolutionize IT delivery and business performance. Vineet correctly pointed out (in his own flamboyant way), that the industry has a long way to go with regards to Cloud-enabling many critical business applications and developing more realistic cost-models, but we're definitely moving past that hype phase in terms of preparing for disruptive change. 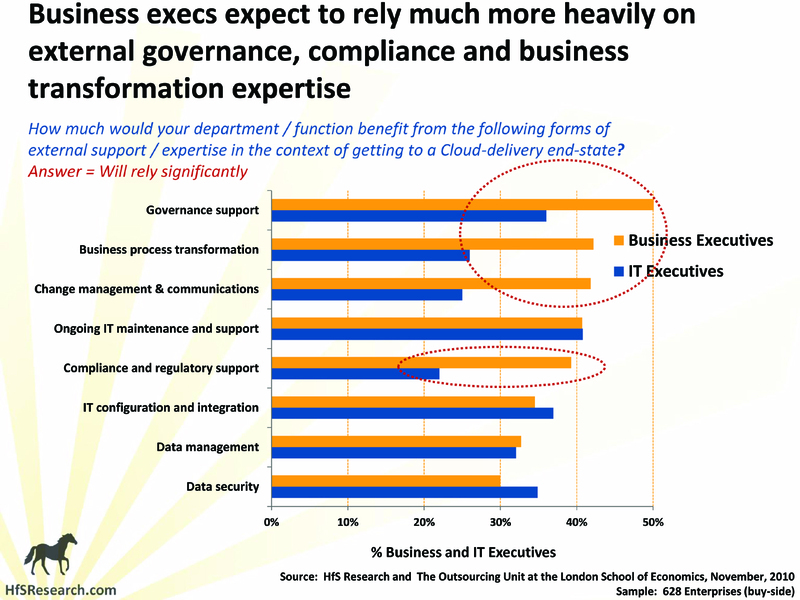 Can Cloud Computing and Related IT Governance be Outsourced?